Peripheral neuropathy is damage that occurs to your peripheral nerves, resulting in pain, tingling numbness or a burning sensation. Neuropathy usually begins at the end of your longest nerves, which are in your feet and hands. Nerve damage from neuropathy can be caused by a number of different conditions, including diabetes and vitamin B-12 deficiency. Vitamin B-12, also known as cobalamin, is an essential water-soluble vitamin that is important for the proper formation of red blood cells. 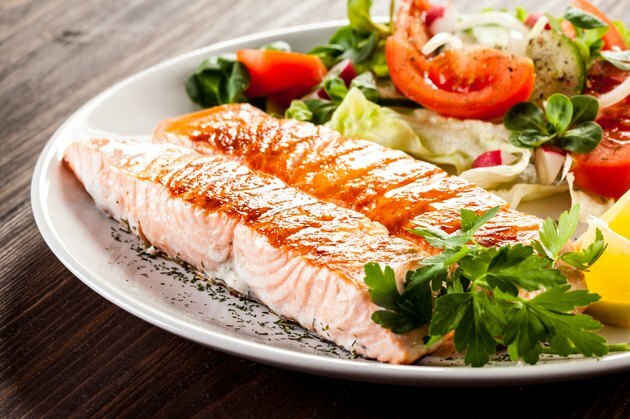 Vitamin B-12, which is easily obtained from animal-based food sources like fish and meat, is also required for healthy brain and nerve functions. According to The Merck Manuals Online Medical Library, vitamin B-12 deficiencies can lead to peripheral neuropathy, although deficiencies are rare and usually occur in vegans and elderly individuals. According to the Neuropathy Association, there are several types of neuropathy, including diabetic, compressive, hereditary, drug- or alcohol-induced, cancer-related, gastrointestinal-related or nutritionally related neuropathies. Most approaches to peripheral neuropathy are targeted at limiting the damage and managing the symptoms. The first line of treatment for any type of neuropathy is to treat the underlying cause, like controlling your diabetes, abstaining from alcohol or drug use, or treating a nutritional deficiency. Physical therapy may be useful for some cases of neuropathy, especially if it is the result of a physical cause like an accident or compressed nerve. Pain medications may be used to effectively manage painful neuropathy. If the underlying causes of peripheral neuropathy are not addressed, the damage to the nerves will keep progressing. Major complications of severe neuropathy include infections that lead to limb loss, permanent limb damage, muscle atrophy, difficulty breathing and swallowing, heart arrhythmias, and complete loss of sensation or movement. Always be wary about the purported benefits of using alternative medicines to treat a serious medical condition, and discuss your intentions with your doctor to beginning any such regimen.